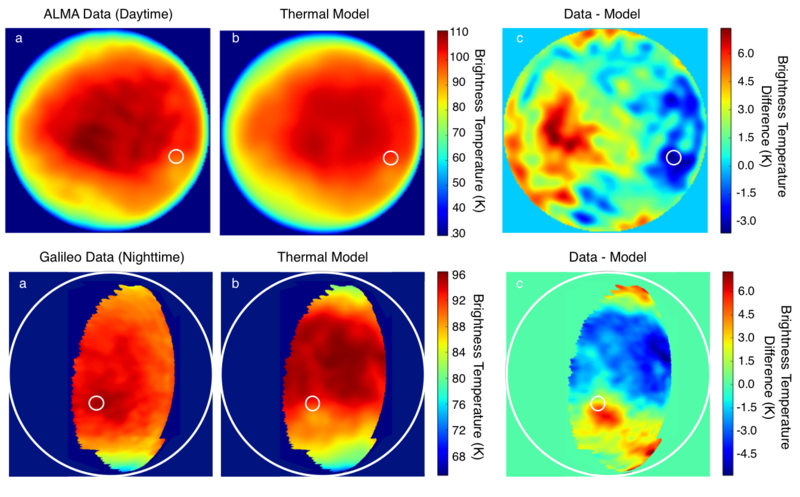 In the months since I first posted about the potential hotspot on Europa associated with a potential plume on Europa, I’ve been refining our computer model and digging deeper into trying to understand what is going on. As you’ll remember from the last post, a potential plume spotted on Europa looked like it might be coming from a spot that the Galileo spacecraft had earlier shown was hotter at night than it should be. We discussed two potential explanations for this night time hot spot. The more exciting explanation was that the spot in question could be experiencing excess subsurface heat flow due to recent or ongoing geologic activity, as one might expect from an area with potential active plumes or geysers or volcanoes or whatever. The other possibility was that the spot may be hot at night due to its specific thermal properties, particularly its thermal inertia. A high thermal inertia could keep the location warm during the night, but it would also make the same spot harder to heat up during the day – think about how pavement stays warm after a hot day long after the sun has done down but is also cooler than it should be in the morning. A spot actively heated by geologic activity, in contrast, would maintain elevated temperatures throughout the day-night cycle. With only the Galileo night time temperature measurements, there was no way to know which of these two scenarios was occurring. Luckily, we have recently obtained daytime temperature measurements using the new massive new ALMA telescope in Chile. Our daytime ALMA observations allow us to tell the difference between these two scenarios. We left you last time with the puzzling observation that the potential hot spot was actually a little colder in the ALMA daytime image than our model predicted. After extensive testing and refinement of the model, that finding remains true. Here is our updated data-model comparison. The location of the proposed hot spot is indicated by the white circle and, relative to our model, it is cold during the day and hot at night. At first glance, this pattern seems more like a potential thermal inertia anomaly than an active hot spot. To look a bit closer, we modeled the location throughout the Europa day to better examine the day-night temperature profile and see what it would take to fit both the Galileo and ALMA temperatures. Below you can see our three modeled scenarios. The green curve is our model’s predictions for the proposed hot spot. 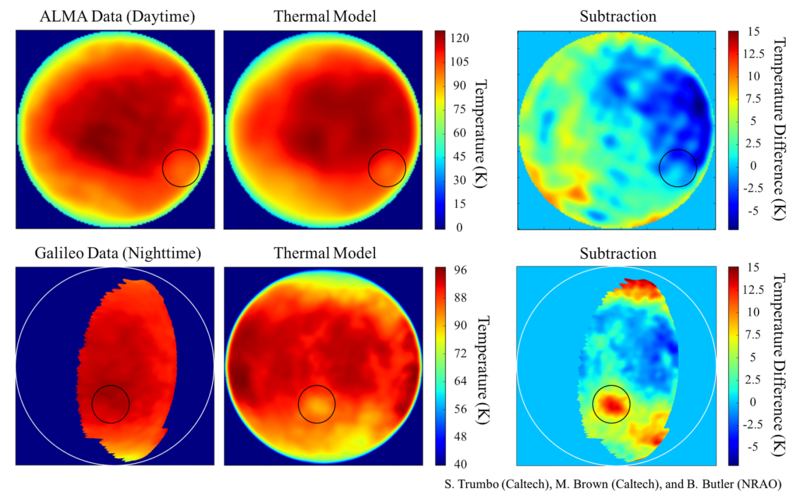 Like you saw in the first figure, it underestimates the nighttime temperature from Galileo on the left and overestimates the daytime temperature from ALMA on the right. To test the hypothesis of subsurface heating, we increased the heat flow in our model, which produced the red curve. In this case, the amount of extra heating needed to match the Galileo nighttime temperature created a daytime temperature that is much higher than we observe with ALMA. However, when we simply increased the model thermal inertia (with a small albedo adjustment within our uncertainties), we were able to fit both temperatures well. Sadly, this suggests that the potential hot spot associated with the potential plumes is most likely just a spot with a higher than average thermal inertia, making it especially good at retaining daytime heat into the night. You might rightly be wondering why this one spot should have such a relatively high thermal inertia. The answer could be because of its proximity to Pwyll, the biggest, freshest crater on Europa. Pwyll Crater is just below and to the right of the proposed plume location and, interestingly, is even more anomalous. It is also cold during the day, and it is the big, obvious red anomaly on the night side. So, it is not just the proposed plume source that appears to have an elevated thermal inertia, but the entire Pwyll Crater region. This could be because material ejected during crater formation is blockier than the rest of the surface, so that it acts more like rock than sand. It’s also possible that the impact exposed purer water ice, allowing sunlight to penetrate deeper into the surface in this area. That sunlight would be stored as heat below the surface, which would be released slowly at night, mimicking the effects of a high thermal inertia. Really, we don’t know for sure what would cause the elevated thermal inertia, but it looks like the possibility of subsurface heating is unlikely. So the purported hot spot is still unique, but not so hot. What does this mean for the plumes? Our observations do not specifically address the existence or nonexistence of the plumes. They do, however, suggest that the proposed detections are not associated with an active hot spot, which would have otherwise made the potential plume detections much more convincing. In the end, we still don’t know, but we are excited about what else the ALMA datasets might tell us about the surface. I know, I know. We have all been instructed by Arthur C. Clarke to attempt no landings on Europa. But if you did land on Europa, wouldn’t you like to know where to go? If you do, my graduate student, Patrick Fischer, has a paper coming out that you probably want to read. First, perhaps, it might be best to understand why anyone would want to land on Europa at all. Europa – the second of Jupiter’s four large satellites – is clearly a special place. Ever since the time of the Galileo spacecraft nearly 2 decades ago, we have recognized that Europa’s fresh icy surface, covered with cracks and ridges and transform faults, is the external signature of a vast internal salty ocean. If, on a whim, you climbed down a crack on the surface of Europa and made your way down into the ocean (which, interestingly, might be something you actually could do; though it is more likely you would get stuck and squeezed to death; hard to tell) and then you figured out how to swim down to the rocky bottom something like 100 km below the base of the ice (a depth 10 times greater than the Marianas Trench, by the way) you would instantly be able to answer what to me is one of the most interesting mysteries about Europa. What is happening at the boundary of the rocky core and the ocean? The answer has profound effects on the type of world that Europa ultimately is. What might be happening down there? The least interesting possibility is that the bottom of the ocean is a stagnant, inactive place: water on top; rock on bottom; a little dissolution of the rock into the water in between, but, otherwise, with not much going on. A world like this wouldn’t have much of a source of chemical energy in the ocean, and it’s hard to imagine it could support even the most elementary types of life. If you had taken all of that effort to swim all the way to this cold dark dead ocean bottom, you might start to ask yourself whether or not it was even worth it. The most interesting possibility – at least the most interesting possibility that I can think of – is that the rocky bottom of the ocean is almost like a miniature Earth, with plate tectonics, continents, deep trenches, and active spreading centers. Think about mid-ocean ridges on Earth, with their black smokers belching scalding nutrient-rich waters into a sea floor teaming with life that is surviving on these chemicals. It doesn’t take much of an imagination to picture the same sort of rich chemical soup in Europa’s ocean leading to the evolution of some sort of life, living off of the internal energy generated inside of Europa’s core. If you’re looking for Europa’s whales – which many of my friends and I often joke that we are – this is the world you want to look for them on. Sadly, no one is going to climb down through a crack and then swim to the bottom of Europa’s ocean for a long long time, so this is where landing on the surface comes in. If the chemicals that are dissolved inside of the ocean could somehow make it to the surface, we could learn a lot about what is going on deep inside of Europa just by analyzing a little a sample of the surface. OK,then, let’s go land! But where? You probably only get one shot at a lander, and you probably don’t get to move once you land, so you had better pick the right spot. The announcement a couple of years ago, that plumes of water jetting from Europa’s south pole had been discovered by the Hubble Space Telescope, seemed to have answered the question: land at the pole, and wait for plumes to rain down upon you (or, perhaps even more easily, fly through the plumes and collect samples without even landing!). The bad news, however, is that the plumes now appear to be elusive at best and non-existent at worst. Since their initial detection no one has been able to see them again. Are they (very) sporadic? Was the initial detection an unfortunate spurious signal that was misinterpreted? No one yet knows, but no one today is going to count on plumes for measuring the chemical composition of the ocean. Luckily, our new paper shows that we don’t need plumes to sample the interior, and we even conveniently point out a potential landing area that is large enough to easily target with your favorite lander. First, how do you find a landing site? What we are actually doing is simply mapping the composition of the ices across the surface of Europa. Such mapping has been going since the time of the Galileo mission, but with modern telescopic instruments and high spatial resolution adaptive optics systems on large telescope on Earth, we can do a better job of making global scale maps than the Galileo spacecraft ever could. In the earlier Galileo mapping efforts and in our own early analyses of our own data, we concentrated mainly on dividing the surface of Europa into an ice component and a non-ice component and then trying to figure out what the non-ice component was. Like the earlier Galileo analyses, we found that the dominant non-ice component is sulfuric acid that is created when sulfur (ultimately derived from volcanoes on Io!) 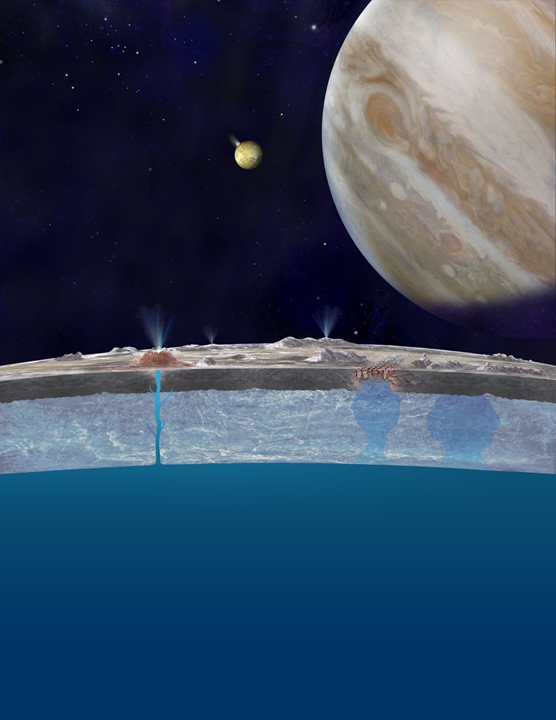 bombards the water ice on the surface of Europa. We also found, though, that some of the non-ice material was magnesium sulfate – Epsom salts, in fact – which we suggested indicated a magnesium source coming from inside of Europa’s ocean that then mixes with the incoming sulfur. Patrick Fischer, in his new analysis, decided to take these ideas one step further. He wanted to know if there is anything else on the surface of Europa besides just the water ice and the sulfur products. To do so, he took the spectra of nearly 1600 separate spots on the surface of Europa and started looking for anything unusual that stood out. The answer was…… maybe. Staring at that many spectra you’re bound to find something to catch your eye. He needed a more rigorous method to group the spectra together, and eventually he developed a very clever new mathematical tool which allows you to take an arbitrary collection of spectra and automatically, with no preconceived human biases, classify them into an arbitrary number of distinct spectra, and present maps of where those materials are present on the surface. When he asked the tool to give him to find the two most distinct spectra on the surface of Europa, he reproduced the ice plus sulfur products distributions that had been known for decades. When he asked for a third distinct spectrum, though, a large region on the surface of Europa suddenly popped out as being composed of material unlike the ice or sulfur products of the previous map. Staring back and forth between the composition map he had just made and a geological map of the surface of Europa, he was startled to realize that he had nearly precisely mapped out one of the largest regions of what is called “chaos terrain” on Europa. On Europa, "chaos terrains" are regions where the icy surface appears to have been broken apart , moved around, and frozen back together. Observations by Caltech graduate student Patrick Fischer and colleagues show that these regions have a composition distinct from the rest of the surface which seems to reflect the composition of the vast ocean under the crust of Europa. Chaos terrain was noticed early on in the Galileo mission as regions which look like the surface of Europa has become cracked and jumbled and – intriguingly – perhaps even melted in recent times. If you had to vote for a location on Europa where ocean water had recently melted through and dumped its chemicals on the surface, you would vote for chaos terrain. And now Patrick had found that on large regional scales chaos terrain has a different composition than the rest of the surface of Europa! And what do the spectra tell us that the unique composition of this chaos terrain is? Sadly, we can’t yet tell. To date, we have not found unique compositional indicators in the spectra of this region, though our search is ongoing. Our best bet, though is that we are looking at salts left over after a large amount of ocean water flowed out on to the surface and then evaporated away. The best analogy would be to large salt flats in desert regions of the world. Just like these salt flats, the chemical composition of the salt reflects whatever materials were dissolved in the water before it evaporated. On the Earth, salt flats can contain any number of exotic salts, depending on the surrounding rock chemistry. On Europa, the salts will tell about the rock chemistry, too, though the rock is the material far below at the base of the ocean. 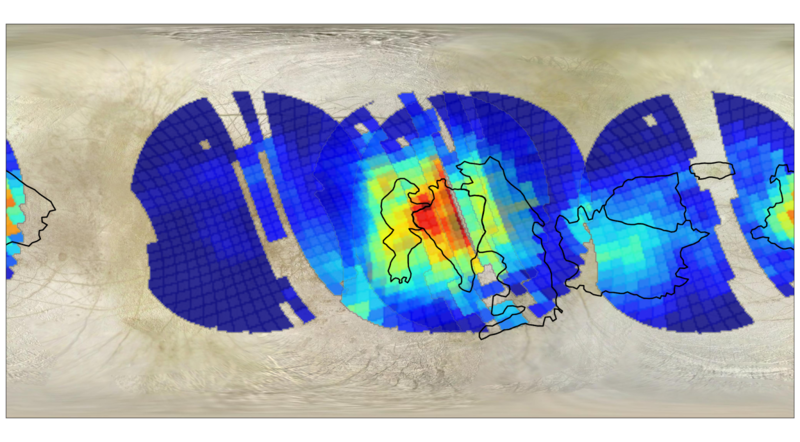 We think, then, that we have found a giant salty patch on the surface of Europa, and very likely the region of most recent resurfacing and undisturbed chemistry. I have tried very hard to get Patrick to call this salty patch Margaritaville, but he does not think that graduate students are quite established enough to make jokes like that. I’ll make it for him, though. And I will tell you: attempt a landing there! Margaritaville will not only have salts that tell you about the rock-ocean interaction, but it will also have samples of everything else that the ocean has to offer. Is there organic chemistry taking place in the oceans? Look in Margaritaville. Carbonates? Margaritaville. Microbes? Definitely Margaritaville. All of these are best searched for with the types of instruments currently roving around on Mars, where you grab a sample, put it into a machine, and read back out the chemical composition. But don’t forget to bring the cameras along, too, just to see what else is lying around. The jumbled and exotic icy terrain is bound to be a spectacular site up close. You might get lucky and see a plume shooting off into the sky in the distance. And maybe, just maybe you’ll even find a few whale bones lying around. Ten years ago today I came in to the same office I’m in at this moment, sat down in the same chair I am sitting in now, probably stared out the window at the clear blue sky much like I’m doing right now. It’s even likely that I drank coffee out of the very cup I’m drinking out of. Other than that, though, nothing was the same. 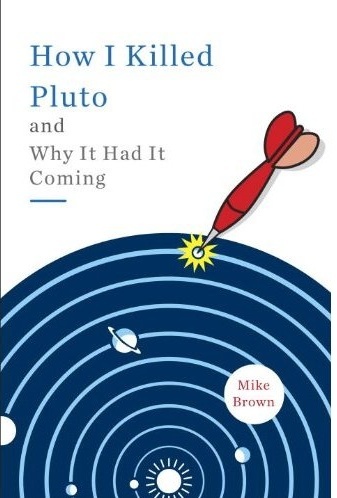 Just a week earlier, on Dec 28th 2004, I had discovered the second brightest object that we had ever seen in the Kuiper belt (the brightest, of course, being Pluto). We didn’t yet know how big it was so my mind kept spinning with possibilities. Maybe it had a dark comet like surface and so to be so bright it had to be really big! Maybe as big as Pluto! Maybe bigger! 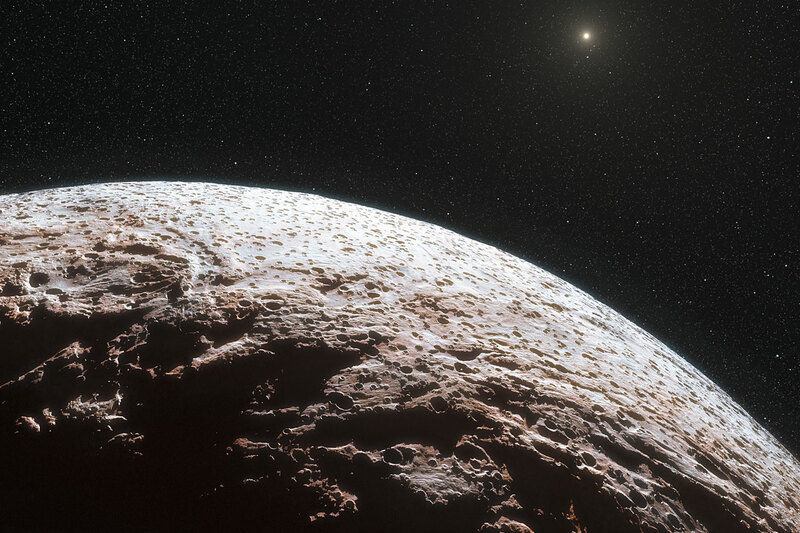 (The object, now called Haumea, is now known to be about a third of the mass of Pluto and one of the strangest objects in the outer solar system). Perhaps even more exciting, I had discovered the object while re-processing old images that I had taken a few years back. There was another year’s worth of images to re-process. Maybe there would be more! My father was a rocket scientist. Well, OK, not precisely. More specifically he was a rocket engineer. Or, more precisely still, he was an engineer who worked on the computers that went into space and navigated the rockets. He worked on the Saturn V that lifted Apollo astronauts toward the moon, he worked on the Lunar Module, which touched down on the moon, he worked on the Lunar Rover, which drove astronauts around on the moon. All of this before he was 30 years old. I never remember him talking about it at all, talking about what it was like to send men to the moon, to be involved in such a tremendous adventure, but, ten years ago, in the little farming town on the edge of the Mississippi River where he grew up, I had a conversation with one of his friends from those days, and he told me that they all felt like they had lived in a magical time. After the Apollo missions ended, they all later worked on the Space Station and more mundane things like the ticket-taker on the BART trains that I used to take when I was a graduate student living on the San Francisco Bay. But nothing in their lives was ever quite like a being a bunch of thirty-year-old kids living in northern Alabama having the blind optimism to think that if there was a rocket being built they knew enough to put the computers together to make those rockets bring people to the moon. And back. And then actually doing it. It didn’t snow much in northern Alabama where I grew up, so, when I went to college further north, I was at a serious disadvantage when the first blizzard came through and everyone streamed out of the dorms to engage in an all night snowball fight. After my first rounds of fusillades ended up splintering to little wispy bits in midair I quickly got the hang of compaction, looking for wetter snow, and doing what I could to increase the density of the snowballs. I broke a window, confessed, and escaped punishment with the lame but true excuse that I had no idea snowballs could break windows. Friends with more snowball experience and more delinquent childhoods told me about burying a stone or two inside of the snowball to increase its destructive power. These look too fluffy to me. I don't think they'd survive flight. I don’t get much snow in southern California, but I do spend a lot of my time thinking about those early snowball experiences and about the snowball fights that have made the objects of the outer solar system.